The billionaire CEO at Foxconn Technology group, the main assembler of Apple’s iPhones, argues that the unreasonable overtime hour restrictions in China hurt his employees and the competitiveness of the company. 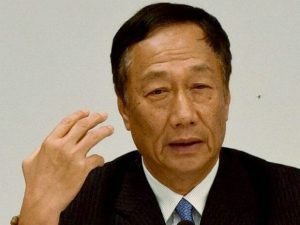 Terry Gou, the CEO of Foxconn, said that in relation to criticism about how the company over works employees to meet the soaring demand for iPhones prior to the annual holiday shopping season that his workers actually want more hours of work and forcing them to work less reduces much needed income for them. Foxconn, which as the largest private employer in China, keeps close to one million people on its different payrolls, but has come under fire for several years over its practices of allowing overtime hours to soar to extreme levels during the peak shopping season, as it ramps up its productions levels to get the devices out to market before the huge shopping season. Gou did say however, that was normal in other areas of the world and stressed that the biggest challenge Foxconn now has was not its labor but the trade tensions amongst the U.S. and China that threaten to create problems with the global supply chain. Gou said that the company has several response plans. The Foxconn CEO said that the trade war was not about trade, but instead has become a tech war and a manufacturing war. The rising economy in China and it increasing technological prowess is where the dispute with the United States is centered and aimed at opening the Asian country to businesses in the U.S.
Gou argues that Foxconn should be governed by regulations in the U.S. since as the largest electronics contactor in the world, a large number of its customers including Amazon.com, American Airlines and Apple are U.S.-based. The CEO repeated the company pledge to employ robots that would replace close to 80 % of the workforce over the upcoming years, as a possible solution. China has tougher regulations about overtime that does the U.S. or anywhere in the European Union, and they know those are unreasonable regulations and unreasonable laws. At this point during the quiet season, Gou said the company was following regulations set down by China, in during the peak season, U.S. regulations will be followed.